Katie Lee Dunbar is a femme, queer feminist performer and visual artist based in Berlin. 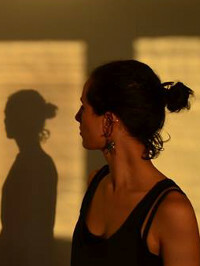 Her research focuses on voice, memory, movement, sound, language and installation. In situations such as international festivals, exhibitions, non-profit organisations, theatres and public spaces. Katie deals with topics of disparity, intimacy, exchange and the intersection between the personal and political.